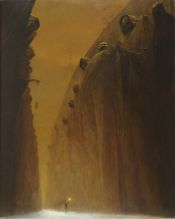 Beksinski is recognized by recipients of art, above all, as a creator of original and evocative painting. The museum's collection of the paintings had been gradually expanding during the life of the artist. After his death, it was significantly enriched by the works inherited by the museum, according to the artist's will. The current collection contains over 200 paintings, representative for all periods from the earliest works to the last painting painted in February 2005. 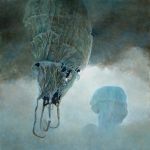 In the early artistic path, Beksinski's art evolved and transformed its character. Starting from the abstract painting, the artist quickly found his own, unique and recognizable style. Surprizing discovery of 29 paintings on glass from 1957 took place two years after his death. Free and spectacular play of colours is characteristic of these paintings. Some of these works are parallel to the works painted in pastels, but expressiveness is intensified here by the matter of painting and more intensive palette of colours. 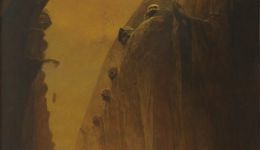 In spite of great critical acclaim received for his avant-garde art, Beksinski is ranked as one of the most eminent modern artists thanks to the completely different works which have nothing to do with abstraction. The paintings which show deformed, tied figures, with bodies covered with torn, stitched skin and scars were painted in the mid-60s. The time of turning of the 70s and 80s is represented by the works of the fantastic period where overreal visions, coming from the area between day-dream and dream, are transferred from imagination or subconscious onto a hardboard. The spectator is drawn into the visionariness of these images which present metaphysical landscapes, fantastic architecture and phantoms of figures emerging here and there. Ugliness and beauty, tragedy and persiflage, biologism and metaphysics harmonize in painting. This duality seems to be needed for the artist to produce ambiguous, disturbing atmosphere. Excellent workshop and perfectly flat texture make impression of almost graphic design of these works. He had been painting in this convention, with some changes, till the end. In the recent years, he reduced the visionariness and focused on the form and greater tranquillity. The theme is usually limited to a deformed human figure sometimes two figures. Sharp tone of colours is replaced in favor of greater subtlety. The paintings from the recent years, painted shortly before his death, oscillate more and more towards abstraction. They become more ascetic, synthetic and sparing in its form. 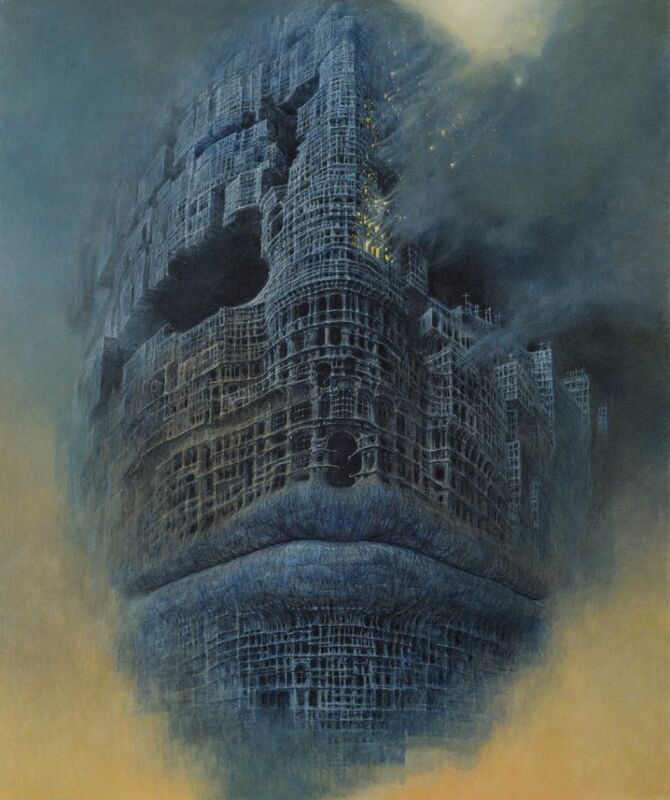 Beksinski's art, creating its own character, is situated as though on the border of different artistic movements.